There's a brand new bulk bin place open right next to the Ponsonby Countdown. Only weeks old but this fancy bulk bin place is already so popular. In GoodFor, everything is clean, uniform, neatly lined bins and jars - it's the pantry of my dreams. 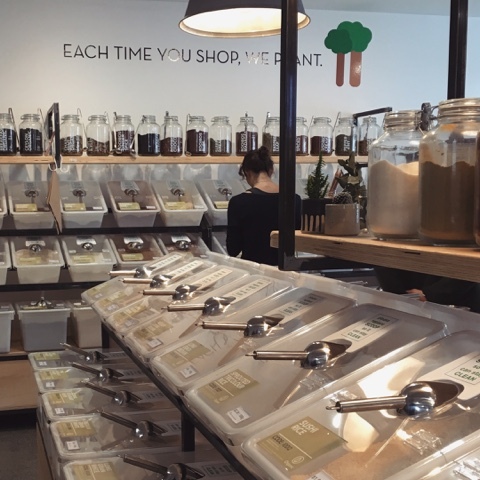 There are sections for liquid soaps, herbs, loose tea, all sorts of flours, snacks, and even a kombucha corner. Most things are organic. Bringing your own containers and bags is highly recommended. We took our own container and got it tared then filled it up with shampoo. They also have a partnership with so with every purchase they plant a tree. The good for is not the first company to have come up with the initiative - Faguo the French sneakers company also do this - but it's still a cool concept. Wish there were more bulk bin options like this available in the supermarkets.